Hats off to The New York Times for being one of the first, if not the first, to report last Friday that Col. Gaddafi’s forces in Libya have been firing cluster bombs into residential neighborhoods of Misurata, the sole city in western Libya still in rebel hands, thereby escalating the possibility of major civilian carnage. Deployment of the weapon, along with ground-to-ground rockets, represents a significant intensification in the two-month old crisis in Libya sparked by the so-called Arab Spring of democratic rebellions that have surged through the Middle East. The Libyan uprising, however, is the only one of these insurrections that has seen direct Western military involvement and it was the apparent threat to civilian life of the sort reported this weekend by the NYTimes and other media outlets that brought that about. Following an allegedly bloodcurdling threat from Gaddafi in early March to exact revenge against the citizens of Benghazi, the eastern city that has been the epicenter of the revolt, the United Nations Security Council authorised the use of force to protect civilians. Both of these so-called indiscriminate weapons, which strike areas with a dense succession of high-explosive munitions, by their nature cannot be fired precisely. When fired into populated areas, they place civilians at grave risk. The dangers were evident beside one of the impact craters on Friday (in Misurata), where eight people had been killed while standing in a bread-line. Where a crowd had assembled for food, bits of human flesh had been blasted against a cinder-block wall. The NYTimes’ report came just as other media outlets, such as The Boston Globe, were beginning to offer a platform to more skeptical analyses of the rationale for war in Libya. These pointed out that not only did Gaddafi not threaten a civilian massacre in Benghazi – this claim was made instead by rebels – he had offered an amnesty to those who threw their weapons away and even offered rebels an escape route to Egypt. The use of cluster bombs, however, tilts the balance the other way, strengthening the view that Gaddafi is prepared to kill his own people in order to survive. Nonetheless cynics will be suspicious about this report and its timing. After all, it comes as the Western-led effort in the oil-rich North African state is badly running out of steam and disagreements over tactics and strategy are rife amongst the NATO allies. Gaddafi has also taken advantage of confusion in his enemy’s camp and has forced the rebels to flee from eastern cities they had captured. With the rebels’ rag tag army once more on the run, NATO and its political leadership are facing a humiliating setback at the hands of one of the Arab world’s most eccentric leaders. By coincidence or not, the three Western leaders spearheading the NATO campaign, Barack Obama, Britain’s David Cameron and France’s Nicolas Sarkozy, put their names to an Op-Ed which appeared this weekend in major US and European newspapers that appeared to admit for the first time that the aim of the operation was now not just to protect civilian lives but to effect the ousting of the Libyan dictator. 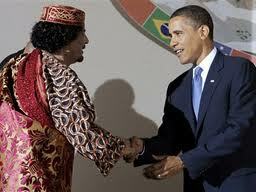 Prior to this Obama, for one, was keen to rule out any charge that he and his allies planned to overthrow Gaddafi. “Broadening our military mission to include regime change would be a mistake”, he told the American public last month. It was a stance dictated by the knowledge that doing otherwise would not go down well in the Arab world. It was one thing to drop bombs on Arab cities in the name of humanitarian exigency, but, in the context of Bush’s war in Iraq, an entirely different matter when the goal was to get rid of a government. In the wake of a growing stalemate in Libya, however, that had changed. 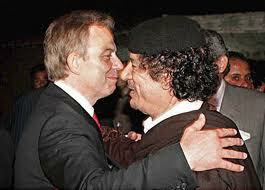 Now, the trio of war leaders said in their Op-Ed: “Colonel Gaddafi must go, and go for good”. The cynic will say that the curtain has now been pulled aside to reveal the real motives behind the NATO campaign, for which the expression of humanitarian concern was a convenient cover. The real goal was to extract payback from an Arab leader who was a real thorn in the West’s flesh not that long ago, whether by cocking a snook at the Reagan White House, funding and arming groups like the IRA which came close to assassinating a British prime minister or stirring up trouble in a host of Arab and African countries whose leaders were allies of the West. According to this scenario this was too good an opportunity to settle some old scores, notwithstanding Gaddafi’s humbling, not to say embarrassing efforts to ingratiate himself with the West in recent years (his new pals included Tony Blair, who was on the family payroll according to Gaddafi’s son Saif, and Silvio Berlusconi who is said to have got the idea of hosting his now infamous “bunga-bunga parties” from Gaddafi). That Libya also produces the highest grade oil of any Arab state and that the people who are slated to take over from Gaddafi will likely be grateful to the West in all the most suitable and appropriate ways is a bonus, and a big one at that. 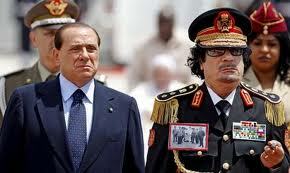 Muammar and Silvio: Gaddafi "introduced Italian leader to bunga-bunga parties"
All of this may well be true but to suggest, as some might, that The New York Times story is therefore a very timely and convenient excuse for NATO to escalate the war against Gaddafi would be a good deal more credible if the story itself was dodgy and on the level of say Judith Miller’s notorious aluminum tubes report, a piece of fiction which helped the Bush White House raise the spectre of a nuclear-armed Saddam Hussein to justify the Iraq war while staining The NYTimes’ reputation, some say indelibly. But that doesn’t seem to be the case. The NYTimes reporter, CJ Chivers was able to examine and photograph remnants of three mortars fired last week at Misurata, each filled with twenty-one “submunitions”, i.e. smaller bombs designed to kill people and penetrate armor. He was also able to trace the bombs to their Spanish manufacturer, Instalaza and quoted Human Rights Watch, the New York-based advocacy group which verified that cluster bombs were being used by the Libyan government forces. For good measure, Chivers noted that the United States is not amongst the countries who have signed a Convention barring their use, implying therefore that any attempt by America to make a human rights issue out of all this would sound hypocritical to say the least. (US forces also used the weapon in Iraq, causing sometimes terrible civilian casualties) He also spoke to eye witnesses who had been nearby when the cluster mortars landed and exploded. So all in all a solid, well-reported piece of journalism and an article of which The New York Times can be justifiably proud. I mention all of this by way of contrast and the contrast is to the same paper’s coverage of the Israeli invasion of Gaza in December 2008 and January 2009, a military operation that was code named Operation Cast Lead and whose principal victims were also civilians. According to Palestinians sources quoted in the Goldstone Report between 1390 and 1440 people were killed by the Israeli Defence Forces (IDF) during that two or three week-long incursion and the vast majority, perhaps as many as 75 per cent, were ordinary, non-involved Gaza citizens. Over 100 women were killed and possibly as many as 350 of the fatalities were children. The Israelis have starkly different numbers which claim that the bulk of the dead were militants or combatants but have failed to produce evidence to back up their figures. The civilian death toll was perhaps not on the same scale that Barack Obama seemed to suggest would have happened in Benghazi but for the intervention of the US and her allies but nonetheless it was large enough to suggest that the aim of the operation was less to punish the Hamas activists who were firing rockets into Israel and more to teach the population of Gaza a brutal lesson for voting Hamas into power and/or continuing to give them support. The disparity between civilian and military casualties was large enough by itself to warrant the suspicion that this or something like it was the real mission goal and so was the choice of weaponry employed by the Israelis in Gaza’s packed, built up areas where the average population density is some 4,500 people per square kilometer. The scale of civilian killings in Gaza was sufficiently large to inflame international public opinion and to oblige the United Nations to launch an investigation into Operation Cast Lead. The results of that investigation, the Goldstone Report, have damaged, possibly beyond repair, Israel’s already tarnished reputation for disrespecting the rights of Palestinian Arabs. 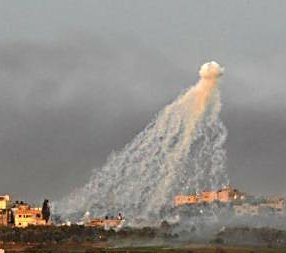 There is little doubt that the most controversial and disturbing weapon deployed in Gaza by Israel was white phosphorous (WP), a substance that is used conventionally to generate smoke and provide cover for troop movements. For that reason it is not a banned weapon. But using it in densely populated urban areas is an entirely different matter. Israel claimed it used WP legally, to give her soldiers a smokescreen but on the ground, in the tightly packed streets of Gaza it killed, maimed and terrified civilians. WP is used in two ways. 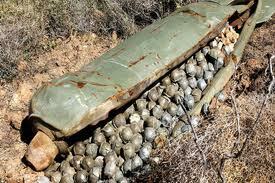 Encased into artillery shells, it can be fired at ground targets like normal ordnance or it can be fused to explode in mid-air, showering down multiple streams of deep-yellow colored phosphorous embers. The chemical ignites when exposed to oxygen and can only be doused, but not extinguished by a covering of dirt of sand. 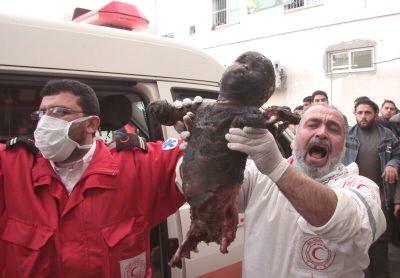 The effect of white phosphorous raining down on Gaza’s civilian population was devastating. Doctors interviewed by the Goldstone team spoke of horrifying burn injuries to its victims. WP sticks to the flesh and will burn until all the phosphorous is exhausted. In some cases victims were treated only to return the next day with wounds that were smoking with remnants of WP still burning deep into tissue and sometimes into the bone. Medical staff learned that the only effective way to treat WP victims was to cut away large portions of flesh around the affected area. Some had limbs amputated, others were burned to death. Although there is little doubt that many more Gazans were killed by conventional weapons the gruesome, indiscriminate cruelty of white phosphorous marked it out as a truly horrifying and repellant weapon. The Goldstone team indicted Israel for its use of the weapon, saying it had breached Articles 18 and 19 of the Fourth Geneva Convention which declare hospitals off-limits during wartime and parts of Protocol One of the Convention, effectively saying that Israel had undertaken military operations while disregarding the consequences for civilians. The Convention bars the use of WP against civilians and while Goldstone didn’t charge Israel with deliberately flouting the law, the report did say that the IDF was “systematically reckless” in its use of the weapon in built-up areas. One member of the Goldstone mission, former Irish Army officer, Colonel Desmond Travers has estimated that some 3,500 white phosphorous shells, containing around 400,000 individual wedges of the chemical were fired by the IDF during the incursion of Gaza. On 4 January 2009, the bombardment reportedly increased as Israeli troops moved into and took control of al-Atatra neighbourhood. The Abu Halima family was sheltering in the home of Muhammad Sa’ad Abu Halima and Sabah Abu Halima in Sifaya village. The house has two floors; the ground floor is used for storage and the living quarters are on the upper floor. According to Sabah Abu Halima, 16 members of her immediate family were sheltering on the upper floor. In the afternoon, after hearing that a shell had hit the adjacent house of Sabah Abu Halima’s brother-in-law, most of the family moved from the bedroom into a hallway in the middle of the upper floor, where they thought they would be better protected. 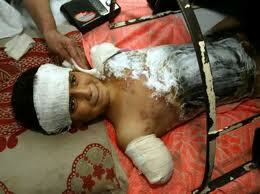 At around 4.30 p.m., a white phosphorous shell came through the ceiling into the room where they were sheltering. According to family members who survived, there was intense fire and white smoke in the room, the walls of which were glowing red. Five members of the family died immediately or within a short period: Muhammad Sa’ad Abu Halima (aged 45) and four of his children, sons Abd al-Rahim Sa’ad (aged 14), Zaid (aged 12) and Hamza (aged 8), and daughter Shahid (aged 18 months). Muhammad Sa’ad and Abd al-Rahim Sa’ad were decapitated, the others burnt to death. Five members of the family escaped and suffered various degrees of burns: Sabah Abu Halima, her sons Youssef (aged 16) and Ali (aged 4), daughter-in-law Ghada (aged 21), and Ghada’s daughter Farah (aged 2). So how did The New York Times cover the deployment of white phosphorous by the IDF in Gaza? Again by way of contrast, the best way to start answering that question is perhaps to look at how one its European rivals covered the same story. The paper in question is The Times of London. Now this is a paper that is part of Rupert Murdoch’s stable and the people at The New York Times tend to look down their collective noses at anything published by News International. After all, many of Murdoch’s publications do have a reputation for tabloid-like trashiness, a scant respect for the facts and little in the way of ethical standards: take a look, for instance, at the phone hacking scandal currently embroiling The News of the World in London. Not all of Murdoch’s children are brats, however, and The Times can sometimes rise majestically to the occasion. 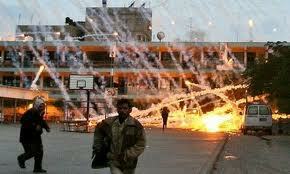 Its coverage of Israel’s deployment of white phosphorous was one such instance. The paper’s first story appeared on January 5th under the headline ‘Israel rains fire on Gaza with phosphorous shells’ and two days later, on January 8th, followed that up with a story about the horrifying injuries caused by WP, while noting that the IDF’s official denials that the weapon was in use and identifying the shells as being of US origin: “There is also evidence that the rounds have injured Palestinian civilians, causing severe burns. The use of white phosphorous against civilians is prohibited under international law”. Another story on January 12th provided more detailed evidence of widespread civilian casualties caused by the weapon. So how did The New York Times compare to its British equivalent? I did a search of the paper’s website and archive and trawled Lexis-Nexis for references in the paper to white phosphorous during Operation Cast Lead. In total there were just five reports and with the exception of the last article, filed after the Israelis had withdrawn from Gaza, the NYT’s references to WP were perfunctory, repeated IDF and Israeli government explanations for its use and made little if any mention of the death and injury caused to Gazan civilians. The second report came on January 16th, five days later and dealt with the shelling of the UNWRA complex. The article dwelt on Israeli doubts about the UN’s neutrality and complaints about its “institutional bias”, carried the IDF claim that its shelling was in response to Hamas fire and devoted just two paragraphs in a 1600 word article to the use of White Phosphorus. Citing agency representatives who were present during the attack, Mr Gunness (a UNWRA spokesman) said three white phosphorous shells had hit the compound, causing fires that raged for hours, an allegation to which the Israeli military did not respond. White phosphorous is a standard, legal weapon in armies, long used as a way to light up an area or to create a thick white smoke to obscure troop movements. While using it against civilians, or in an area where many civilians are likely to be affected, can be a violation of international law, Israel has denied using the substance improperly. On Wednesday, Hamas fired a phosphorous mortar shell into Israel, but no-one was hurt. On January 22nd, the day after Israel withdrew from Gaza, The New York Times carried two pieces on WP, one by Ethan Bronner and Alan Cowell which reported that Israel had established a military investigation “to look into the issue” of alleged misuse of WP following allegations reported in what an IDF spokesman called “the foreign press”. It was the first admission by the paper that Israel’s use of white phosphorous had angered and incensed international opinion. A second piece, solely by Ethan Bronner, finally put a human face to the consequences of white phosphorous use and reported on the ordeal of the Abu Halima family. Five members of the family, four children and their father, had perished in a WP attack over two weeks earlier and the incident had been widely reported, both in The Times of London and other European outlets, but it was only now that The New York Times was giving the story any coverage. Bronner quoted Sabah Abu Halima, the surviving widow, at length and also doctors who had treated survivors and had seen the horrific injuries up close. One doctor said that in a few cases the damage done by WP was so acute that “seemingly limited burns led to the patients’ deaths.” Sabah Abu Halima’s grief was so profound, she said she wanted to see Israel’s foreign minister and president “burn like my children burned”. It was a good piece of reporting that well reflected the horrors visited upon Palestinian civilians by Israeli white phosphorous. But it came far too late, like the horse that bolted the stable. It also smacked of catch up by the Gray Lady, as if someone in the New York HQ had realized that the paper really ought to say something about the matter given the level of international concern over Israel’s behavior in Gaza. But by this stage the horse had galloped several fields away. It could be said in the paper’s defense that The New York Times was hampered, as was all the media, by Israeli government restrictions on media access to the Gaza war zone. Reporters like Ethan Bronner and Isabel Kershner couldn’t actually report from the ground, could not see the evidence or lack thereof for themselves and couldn’t get to speak to victims like Sabah Abu Halima, much less look into her eyes as she voiced her allegations. All their reports, bar the second Bronner piece on January 22nd, carried the Jerusalem dateline. 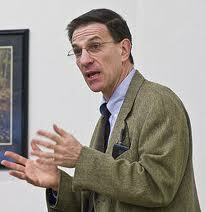 Only when the IDF had evacuated could Ethan Bronner get into Gaza to speak to Palestinians. That all sounds reasonable except for one thing. Like the NYT, The Times of London’s reports were all datelined Jersualem and for its detailed coverage of events on the ground in Gaza the paper seemingly relied on local stringers. And it managed to report in considerable detail both the use of WP and the devastating injuries being caused. So what about The New York Times? Did the paper have someone on the ground in Gaza and if so, why didn’t its coverage match its English counterpart? Ms El-Khodary may well have written about white phosphorous but if so, her reports about its use, the evidence she had found and her assertion that the weapon was used in “densely populated areas” never appeared in her paper, at least no edition available in any archive that I could search. In all of this, it may entirely be a coincidence that the NYT’s Jerusalem bureau chief Ethan Bronner has what many would see as a major conflict of interest. He is married to an Israeli citizen and his son is a soldier in the Israeli army. Philip Weiss in his Mondoweiss blog reported on The New York Times response when Bronner’s background became known: “When it broke the news last year, Electronic Intifada said that it was a conflict of interest; and the newspaper’s public editor concurred; he said that Bronner should be reassigned to some other beat. The Times’ executive editor, Bill Keller, has kept Bronner in Jerusalem, presumably hoping that the issue dies down and no one says anything about it.” (Taghreed El-Khodary resigned when the NYT refused to reassign Bronner and spoke of her “disappointment” at the paper’s decision). 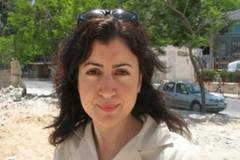 The NYT’s other Jerusalem-based correspondent Isabel Kershner is an Israeli citizen. Perhaps it is unfair to suggest that such considerations would or could affect how a journalist covers a particular story or how a newspaper should regard his or her stories. But put it this way. If CJ Chivers was a Libyan citizen, or was married to one, and had a son who was fighting for the rebels in Benghazi and all this was known to the world, would The New York Times have been just as quick to publish his story about Gaddafi’s use of cluster bombs, just as confident that it could weather the inevitable controversy?